Trijit provides Exchange 2013 which connects with teams to effectively work together through communicating each other, this in-turn helps the organization to develop in any terms. 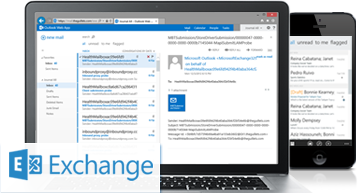 Microsoft Exchange 2013 is better and better solution for the email services for any organization, and which is new version of Microsoft Exchange which has the facility to eliminate email threats before they reach your network. And this which even more protected email solution for mission-critical business. So, Exchange 2013 is the best email solution which safeguards your business important data communicated through email. We deliver rich-featured Corporate-class Hosted Exchange 2013 email services with 25 GB mailboxes size along with 30 MB attachment size. Trijit manages the whole Exchange server 2013 which is risk-free email solution for any organization. Trijit provides Exchange Hosting 2013 from all its Data centers along with data backup and disaster recovery facilities which helps in having your data secured and safe. Trijit has a bunch of teams which works on managing and monitoring exchange servers 24/7. Microsoft Exchange 2013 has the automatic patching feature which completely eliminates the time and effort of maintaining exchange email server. Trijit introduces Legendary Support which can have support 24/7 with online interface like Online Livechat and single point of contact phone support and email support where all support emails gets solution along with reply within 15 Minutes from the support email reaches Trijit.